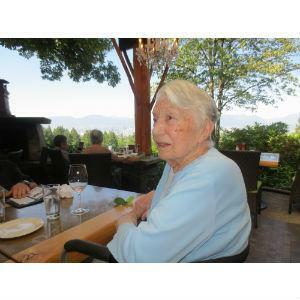 Lucie Steinmann, 96, passed away peacefully on May 13, 2018 in Vancouver, B.C. Born in Poland to Maria (nee Mietelska) and Lorenz Sciubidlo, she lived and worked in Germany and Switzerland, finally settling in Canada. She was predeceased by her loving and devoted husband, Gustav Steinmann in 2008 and leaves behind her daughters Angela (Joseph) and Alexandra (Neil) and her three beloved grandchildren Ashley, Trystan and Sarah. Lucie…Lucyna… mom… passed away on Mother’s Day. She chose this day I think to remind us that she was first and foremost a mother and a mom. Mom was also a woman of strength, character and conviction. She came by it naturally but developed and honed these traits throughout her long life. Perseverance, resourcefulness and faith were additional qualities that got her through the depression as a child and the war as a young woman filled with hopes and dreams. The War was not something she shared openly with us. The memories of this time of mom’s life brought her much pain and sorrow. However, one good thing did come out of the War — she met her husband (our dad) while tending to the nurseries in Southern Germany that produced the fresh food for the war effort. My dad was home visiting family in nearby Bonndorf. Because war and relationship rarely mix well, they parted ways and only reconnected many years later in the Swiss Alps where my mom had settled to work as a nanny. From there they set off on their journey to make a life together in a new country of renewed hope, limitless dreams and wide open spaces that resembled nothing of what they had left behind in Europe. Mom had very fond memories of her time after the War, especially her work as a nanny in Switzerland and her training in the culinary arts. She loved to cook and made many mouth-watering meals for family and friends. She also loved to entertain and brought her European flair to a small mining community in northern Saskatchewan where her daughters were born. By then she was 40 years old but stronger and more beautiful than ever. As remote and rustic Gunnar Mines may have been, mom loved the natural rugged splendor and pristine air of this tiny northern town on Lake Athabasca. She never forgot her time there and the friends that she made. But eventually we left this idyllic part of the country for a new adventure on the west coast in Vancouver where we settled happily as a striving immigrant family. 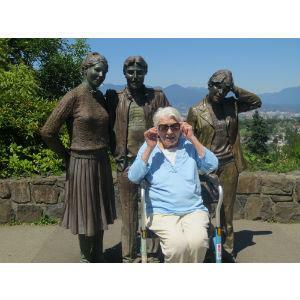 Mom loved the nearby forested park where she and dad walked daily and all the natural amenities Vancouver had to offer. The ocean, the mountains and the city’s gardens all played a part in our lives as kids. Mom also loved to read, a pastime she passed onto her daughters and granddaughters. In her later years, mom liked to peruse Hello Magazine to catch up on the comings and goings of the Royal Family. I think she would have been very happy for Prince Harry and Megan. As adults, whenever we came back to visit, mom would express her love with good nutritious food, some of which she grew herself and, of course, her famous black forest cake, a favorite of the whole family. Mom will be joining spirits with her beloved sisters, Helene and Maria, whom she missed dearly when they passed on to the next life. She will be deeply missed by her remaining three sisters, Gertrud, Eva and Rose who reside in Germany. Special mention to her nephews, Bernhard and Robert, who remained close to mom despite their geographic separation. And so the next adventure begins on her spiritual journey. She knew there was something amazing awaiting her. I don’t think she’ll be disappointed. The family is grateful for Fair Haven Homes and the wonderful staff for taking such good care of mom during her time there. A celebration of life will be held later in the year with family and friends. I came visiting from Europe where i live. I was accompanied by my two big daughters Lydia and Rachel. It was my first visit to my Canadian family for a very long time. It was very important to me to introduce my daughtters to my auntie who was also my godmother and the closest sister to my own mom Helene. I sat down on a bench and wept like a little boy. Knowing i would never meet her again. I believe my two daughters didn’t understand much of the situation and seeing me in this state. I miss my aunt Lucie almost like i still miss my own mom.